Bengaluru: India’s largest online retailer Flipkart has closed a mammoth funding round of $1.4 billion from Tencent Holdings Ltd, eBay Inc. and Microsoft Corp., in the biggest-ever start-up funding round that both boosts Flipkart ability to compete with arch-rival Amazon India and takes the company a step closer to presenting itself (to investors and customers) as the only option to the US firm’s Indian arm. Flipkart Ltd will also buy eBay’s India business as part of the $1.4 billion deal. The funding round values Flipkart at $11.6 billion, which is lower than its peak valuation of $15 billion but still higher than the valuation it was assigned by some of its own investors last year. Flipkart may get additional capital soon as it is in talks to buy smaller rival Snapdeal (Jasper Infotech Pvt. Ltd). Japan’s SoftBank Group Corp., which is Snapdeal’s largest investor, may put in cash into Flipkart if a sale goes through, Mint reported last week. The funding round marks a significant victory for new Flipkart chief executive Kalyan Krishnamurthy, who has led the turnaround efforts at the online retailer after rejoining the company last June. It also increases pressure on Krishnamurthy to carry Flipkart to a much-delayed initial public offering (IPO). “This is a landmark deal for Flipkart and for India as it endorses our tech prowess, our innovative mindset and the potential we have to disrupt traditional markets. It is a resounding acknowledgement that the home-grown tech ecosystem is indeed thriving and succeeding in solving genuine problems in people’s daily lives across all of India," Flipkart co-founders Sachin Bansal and Binny Bansal said in a statement. Mint was the first to report on 23 February that Flipkart was in talks to raise up to $1.5 billion from investors including Microsoft, eBay and Tencent at a valuation of $10-12 billion. eBay, which is also a minority investor in Snapdeal, will invest $500 million in Flipkart with the rest coming from Microsoft and Tencent, a Chinese social networking and gaming Internet firm. The deal valued eBay’s India unit at $200-$250 million, according to two people familiar with the matter. eBay India will continue to operate its platform as a unit of Flipkart; it becomes the latest acquisition for Flipkart, which has bought the fashion retailers Myntra and Jabong as well as mobile payments app PhonePe in the past three years. The Bengaluru-based online retailer fetched a pre-money valuation of $10.2 billion in the latest round. Pre-money refers to the value of the company excluding the round’s capital infusion. 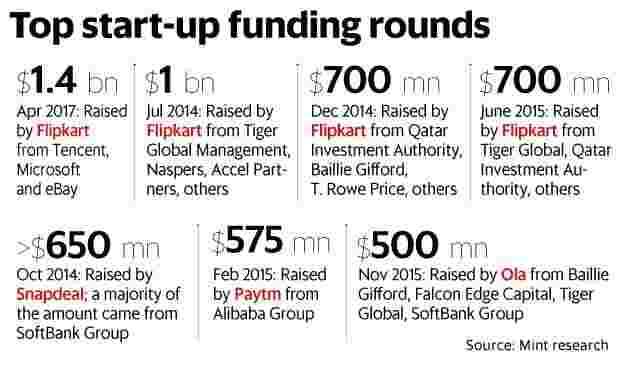 Before this round, Flipkart had last raised funds in June 2015 when existing investors led by Tiger Global Management pumped $700 million into the company, valuing it at $15 billion. While Flipkart’s valuation has declined, it is much higher than what most investors and analysts had predicted given that at least five of Flipkart’s own investors marked down its valuation by up to 60% since February 2016. Flipkart’s case will be bolstered by the profile of its new investors—all three are blue-chip technology or Internet firms. While expectations around the size of India’s e-commerce have significantly reduced from the heady estimates of 2015, it is still considered the last big e-commerce market left. Flipkart is the only local e-commerce start-up that is seen as serious competition to Amazon India over the long term. Flipkart and Amazon are running neck and neck at the top of India’s $15 billion online retail market. Given Flipkart’s recent resurgence, the battle between the two will be much more closely fought this year compared with most of last year, when it looked like the American retailer was running away with the market. Since starting out in 2007, Flipkart has raised nearly $5 billion in capital, accounting for more than 45% of funds raised by all 10 Indian unicorns, which include Snapdeal, Paytm, Ola and Quikr. Amazon has committed $5 billion toward its Indian operations, of which it has already spent more than $2 billion. “This is good news for Flipkart as it solidifies it as a market leader at least in the short term, keeping competition especially Amazon at bay. It is interesting to note that this round sees the investment from strategic investors that will bring technology and market expertise that Flipkart earnestly needs, in contrast to the previous round of mostly financial investors," said Sandy Shen, research director at Gartner.